A high-tech medical part made in Vietnam, the coronary stent from USM Healthcare, has been successfully tested and is ready to be used nationwide. This stent’s price is 60 – 70 percent lower than that of imported ones, which is expected to greatly aid poor heart patients to cure their disease. As shared by Ms. Vo Xuan Boi Lam, founder and member of the management board of USM Healthcare, although Vietnam still largely depends on foreign countries as to medical equipment and it has to spend millions of dollars each year for this, not many domestic medical equipment companies dare to invest into the field. Around 1,400 domestic businesses in the nation mostly import demanded pieces of equipment, yet not many are able to manufacture them. According to Ms. Boi Lam, currently, a stent in Vietnam costs around $2,000, and healthcare insurance has to pay VND36 million ($1,545). As a result, each year nearly VND1 billion ($42,894) is spent for this purpose. Yet to the poor, it is still very difficult to pay the rest. Since producing this equipment is not at all new in the world, if Vietnam can create it, that would be a great help to these people. 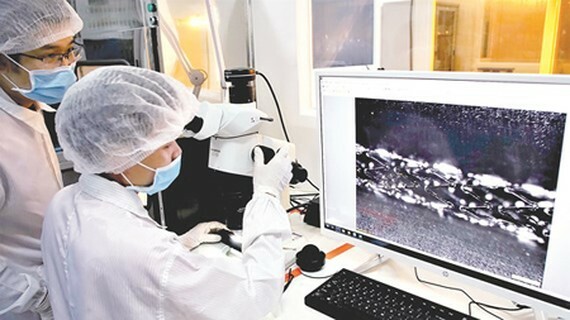 Thanks to the enthusiastic help of foreign professors in developing a coronary stent to serve the Vietnamese, Ms. Lam’s company decided to begin its research, hoping that the successful products will not only be used in Vietnam but also be exported to other nations. The idea was quickly supported and sponsored by the Ministry of Science and Technology. The Ho Chi Minh City People’s Committee also gave financial aid via the stimulus package program as well as allocated the space at the high-tech park in District 9 to help her company. After 5 years overcoming various difficulties, USM Healthcare was able to create a stent that can pass clinical tests of the Ministry of Health and was experimented at major hospitals like Cho Ray Hospital and the People’s Hospital of Gia Dinh in Ho Chi Minh City, E Hospital in Hanoi, and the Hue Central Hospital. The product was also approved by the Ministry of Science and Technology as well as renowned doctors in Vietnam. Therefore, USM Healthcare, which possesses such certificate for medical equipment manufacturing as ISO 9001, ISO 13485, GMP-WHO, has become the second in Southeast Asia (after Singapore) to be able to manufacture coronary stents and balloons. At the moment, the product is waiting for the circulation permit in Vietnam. Discussing the quality of the newly produced equipment, Doctor Nguyen Thuong Nghia, Head of the Heart Department in Cho Ray Hospital said that the clinical tests of the product on 30 – 40 patients all were very successful, without any negative side effects during as well as after operation. The product does not create any technical trouble in the operation process, making the rate of successful performance reach 100 percent. This is absolutely good news to poor patients as well as the government.